There was a time when there was an effort to expand cotton and replace the growing sugar industry with cotton. Maʻo, Hawaiʻi cotton, is actually native to the islands; it’s a member of the hibiscus family. Genetic studies indicate that the Hawaiian cotton is a close relative of the Mexican species. The name maʻo comes from the Hawaiian word ʻōmaʻo for green and shares the same name as the native Hawaiian thrush, ʻōmaʻo which has a greenish cast to its feathers. Once they arrived, they developed several genetic differences but the close relationship to other cottons has made Hawaiian cotton very important in the industry. The early Hawaiians used the flower petals to make a yellow dye; the leaves were used for a light green (ʻōmaʻomaʻo) or a rich red-brown dye. 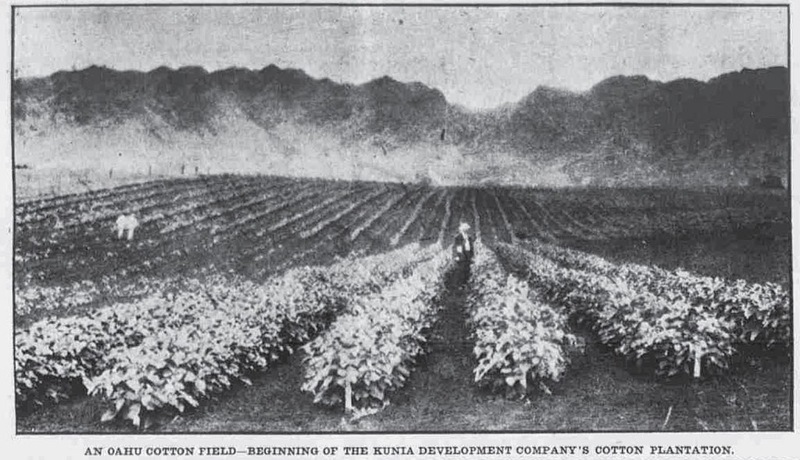 The image shows cotton in Kunia on Oʻahu. (Hawaiian Gazette, November 12, 1909) In addition, I have added other related images in a folder of like name in the Photos section on my Facebook and Google+ pages.